In the last week I’ve had three clients ask me how to automatically syndicate their blog posts to social media. 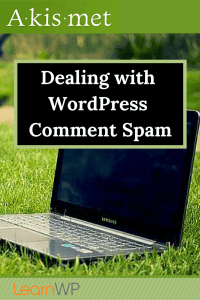 They want to push the Publish button on their WordPress blog and automatically send their post to Facebook, LinkedIn and Twitter. There are any number of tools available. 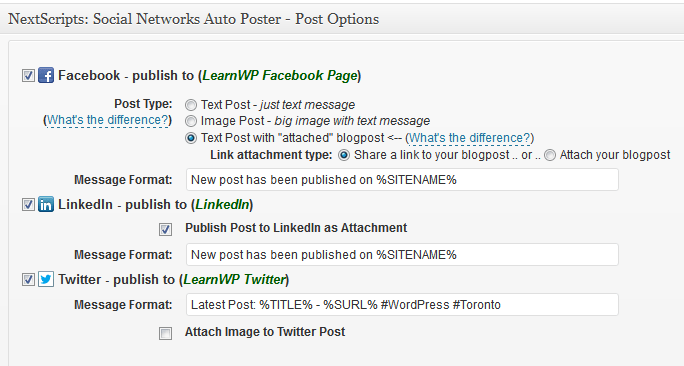 The solution I’ve arrived at is a WordPress Plugin, “Next Scripts: Social Networks Auto Poster“. Install and activate the plugin. Then go to Settings -> SNAP Social Networks Auto Poster. Click the “Add new account” button and choose the Social Network you would like to add. 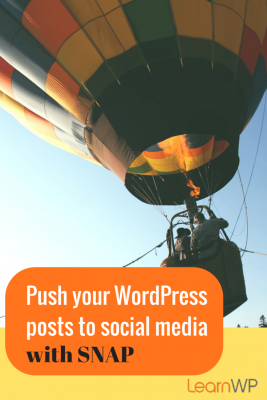 I wish it was as easy as 1-2-3 but you now need to create an app on each social media site to hook it up to your WordPress site. There’s no coding required you just have to follow the instructions provided. You can find detailed instructions on the plugin developers site. This may not be your comfort zone but you really can do this … just follow the instructions. The plugin developer has created a premium version of the plugin that will enable you to automatically publish on Google+ and Pinterest. This is terrific as I haven’t heard of another solution that works for Google+. If you want to publish to multiple accounts, such as a Facebook page and a Facebook profile you’ll need to upgrade to the premium plugin. Notice this new options box at the very bottom of your Edit Post page. You can deselect a platform if you wish to for any given post and customize the message with Twitter hashtags. Now when I publish this post, it will be pushed out and posted as an update on Twitter, Facebook, and LinkedIn. Give it a try and let me know how it goes. Thanks. I will try out this plugin. I’m particularly interested in the premium version that allows you to publish to Google+. I also like that you can select which platforms for each post. That’s much better than another Twitter plugin I tried that broadcasted every change I made and without the possibility of choosing the message format. Thank you for this, but one question: when it pushes my blog posts to a social media platform, can I assume it only pushes what is on my website and nothing embedded in the link? 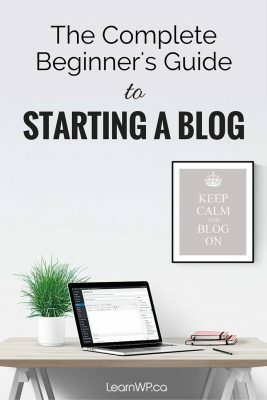 I typically post links to news articles in other publications, with a short snappy introduction, to my website and to my various social media pages, manually or via Hootsuite now. FB and LI will show a graphic, usually a chart of photo, with the posting, which heightens its visibility before my friends and connections. My concern is that if I only push the website post to these platforms, all my friends and contacts will see is the blog posting and probably my own logo. I would prefer they saw some original art from the original article I am calling to their attention. Before I go through the steps outlines above, can you tell me what it does? Frankly, I would likely pass on this app if it precluded pushing the original art. Thank you! You are able to customize the Tweet, LinkedIn or Facebook update for each of your posts in the SNAP area at the bottom of each post. 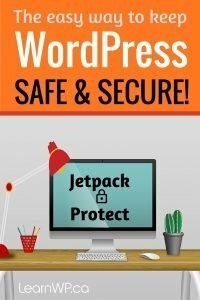 Today I published a post on Jetpack – If you go to our Facebook page you’ll see how it looks from SNAP to Facebook https://www.facebook.com/LearnWP. You can also checkout Publicize from the Jetpack plugin.